Established in 1996, The Webby Awards received nearly 12,000 entries from all 50 states and over 60 countries worldwide this year. 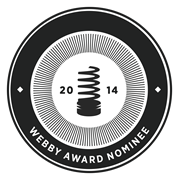 The Webby Awards is presented by the International Academy of Digital Arts and Sciences (IADAS). Sponsors and Partners of The Webby Awards include: Microsoft, Dell, Vitamin T, MailChimp, Engine Yard, Funny or Die, AdAge, Percolate, Mashable, Business Insider, Internet Week New York and Guardian News and Media. "Honorees like Foxtons are setting the standard for innovation and creativity on the Internet," said David-Michel Davies, Executive Director of The Webby Awards. "It is an incredible achievement to be selected among the best from the 12,000 entries we received this year." As a Nominee, Foxtons.co.uk has been selected as one of the five best real estate websites in the world. Foxtons is extremely proud to have been selected as an Official Nominee at the 18th Annual Webby Awards. We are delighted that our continuous effort to deliver the best possible service online and offline has been acknowledged by the industry top leaders.